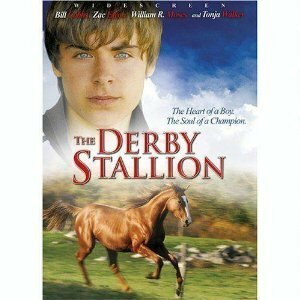 The Derby Stallion stars High School Musical's Zac Efron. He trains to steeple chase with this one horse named Rusty, and it's funny because he falls off more than like 15 times. It's really heartwarming!The process of self-discovery isn't easy, and when 15-year-old Patrick McCardle (High School Musical's Zac Efron) realizes that playing baseball is more his father's dream than his own, it's an unlikely friendship with old man Houston Jones (Bill Cobbs), a recluse and horse trainer, that inspires Patrick's newfound passion for the exciting world of horse jumping. I thought the movie was okay, but WHAT is it with all these Zac Efron comments... They are supposed to be about the movie!? The movie is sad, but inspiring at the same time. I haven't watched it, but I have a feeling it might not be as good as people say so. I own this movie, when I fist got it I watched I everyday for a week! I absolutely love this movie. OK this is great movie its about a man call Houston Jones. Most people don`t like it but there is a boy his name is Peter who plays teaball but he wants to rid horses and in the end he win a big race i don`t want to give to much away. Hi Zac, You are so funny sometimes. I love you! Oh i am Zak Efron's #1fan!! Zac Efron is such a talented actor! epic absolutely epic! loved it. i cannot wait to see it again, watched it 50 times xxxxxxxxxx zac was great! i have it, it is good. i love the horse. Hey gurls! Can you guys please give me some advice My dream is to be an actress in a horse movie! I want to be the girl in the movie who gets the horse to trust her like in Secretariat or National Velvet. Can someone give me some advice on how to make my dream come true? okay, sure Zack efron in a horse movie. by the way where is the horse in this movie? sure there is a horse but not that much and anyways it's pretty much only about zack and his girlfriend, no clue where the horse takes part in this movie. this for me is an okay movie, it's okay for girls who loves zack efron but I wouldn't recommend it at all. I agree with lots of the comment on this movie. i found it quite boring, the guy can't even ride tough. if you wanna see some guy fall off his horse over and over then I can say watch it! This is not a good movie. A five year old would find flaws. Did man from snowy river even make the list? I disliked this movie. His girlfriend is wacko and the old man is not smart. He is a horrid rider and most of the time he just talks about his girlfriend. I DON'T RECOMMEND THIS MOVIE to horse lovers. Believe me you will be bored of it after 10 minutes. Many girls watch this movie just cause of zac - MY OPINION!!!!! OMG! I love this movie! All steeplechase lovers, this is the movie for you! There is a sad part though. There are also some parts where you feel like punching the mean guys. I totally recommend this movie! OMG! I LOVE ZAC EFRON,I WANT TO SEE THIS MOVIE SO BAD!!! hahaahaa Zac fell off!!! Whats the city boy doing in a horse movie I wish the horse kicked him!!! The movie is dumb and Zac can not ride at all. his girlfriend on the movie is and weird and nobody could act except Zac and the old man. Zac Efron is soooooooooooooo cute! best movie in the WORLD! Hey, KIDDOS! You can't say that they're 'only talking!' I love this film and it is not for 5-year olds! Anyone who does not like this is so weird! My and my friend, Ellie, who came round for a sleepover, watched this movie and we couldn't let mum and dad turn it off! It was REALLY Zac Efron! I would recommend this FABULOUS movie to any horsecrazygirl! it was really poor quality for a movie and went no where. Zac is ulgy so there is no point of anyone to watch this horrible movie. my best friend got that movie for christmas and it was hilarious!!!!! but.... i watched bonus features i didn`t believe that zac really learn to jump and every thing like that in just 2 weeks!!!!!! hi zac you are so funnny some times. All that matters is Zac effron and most importantly HORSES and HORSES. This movie is great for 5 year olds. My cousin watched this movie over, and over, and over. I found it too... predictable for kids older than 12. There were only two good actors... The old man and that boy who had just moved there. MY OPINION! Hey Rachel! OMG! I REALLY want to see this movie! Can you comment on my page? (Christina- Horse Lover page2- Picture's Page!). JESUS LUVS YOU!